Jasper is set in magnificent National Park surroundings. 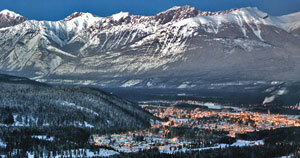 Located a short drive from Jasper Marmot Basin, Jasper has several hotels to choose from. There are no ski-in/ski-out properties available at Jasper Marmot Basin. If you can't find what you are looking for in Jasper, contact us and we will do our best to help. For all PRE-BOOKED ski lift passes through us, you will receive a FREE return ski shuttle pass to Jasper Marmot Basin. This amounts to significant savings! Jasper Marmot Basin ski shuttle passes can be collected from your Jasper Hotel reception. This offer is only available at select hotels. Contact us for details.